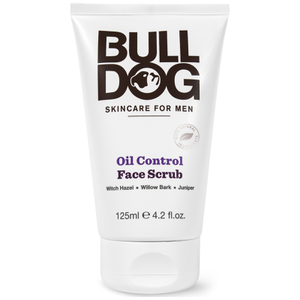 Reveal a clean and clear complexion with the Bulldog Oil Control Duo Set; two grooming essentials to refresh and replenish, without leaving skin greasy or shiny. Housed in a gift box. A lightweight, fast-absorbing formula that delivers long-lasting hydration without leaving skin feeling greasy. Harnessing the powers of Juniper, Witch Hazel and Willow Bark, the moisturiser works to visibly improve skin texture, as well as tackling excess oil to leave skin mattified and free from shine. 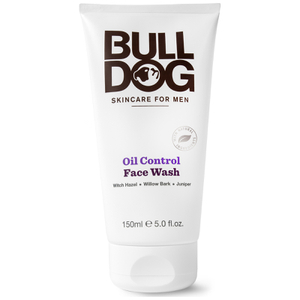 A daily cleanser that is purpose built for men with oily skin. 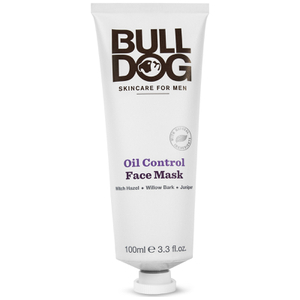 Enriched with a natural blend of Witch Hazel, Willow Bark and Juniper, the effective formula thoroughly cleanses daily dirt and excess oil from the face. Expect soft, clear and healthy-looking skin with minimised shine. Moisturiser: Use morning and night. Apply evenly to face and neck after cleansing. Face Wash: Lather up on wet skin and rinse. 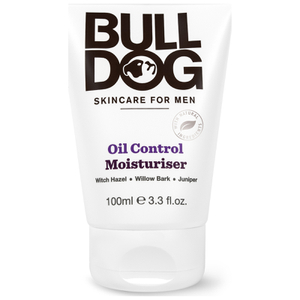 Moisturiser: Aqua (Water), C12-15 Alkyl Benzoate, Tapioca Starch, Glycerin, Sorbitan Stearate, Hamamelis Virginiana (Witch Hazel) Water, Sodium Polyacrylate, Pentaerythrityl Distearate, Phenoxyethanol, Sodium Stearoyl Glutamate, Alcohol, Carbomer, Benzoic Acid, Parfum (Fragrance)*, Tocopheryl Acetate, Dehydroacetic Acid, Sodium Hydroxide, Salix Alba (Willow) Bark Extract, Limonene, Linalool, Juniperus Communis Fruit Extract, Potassium Sorbate, Sodium Benzoate. *A Blend Of Natural Ingredients. Face Wash: Aqua (Water), Cocamidopropyl Betaine, Glycerin, Coco-Glucoside, Acrylates/C10-30 Alkyl Acrylate Crosspolymer, Phenoxyethanol, Sodium Chloride, Sodium Lauroyl Sarcosinate, Benzoic Acid, Parfum (Fragrance)*, Hamamelis Virginiana (Witch Hazel) Water, Dehydroacetic Acid, Alcohol, Salix Alba (Willow) Bark Extract, Juniperus Communis Fruit Extract, Potassium Sorbate, Sodium Benzoate, Sodium Hydroxide. *A Blend Of Natural Ingredients.